Hopes were high when Apollo 13 and its three astronauts blasted off 11 April 1970, intending to be the third mission to land on the moon. However, disaster struck two days later when an oxygen tank exploded 200,000 miles above the Earth. Suddenly astronauts Fred W. Haise, James A. Lovell and John L. Swigert were in a harrowing fight for their lives, with controllers back in Houston, Texas, desperately scrambling to come up with a way to get the men home. 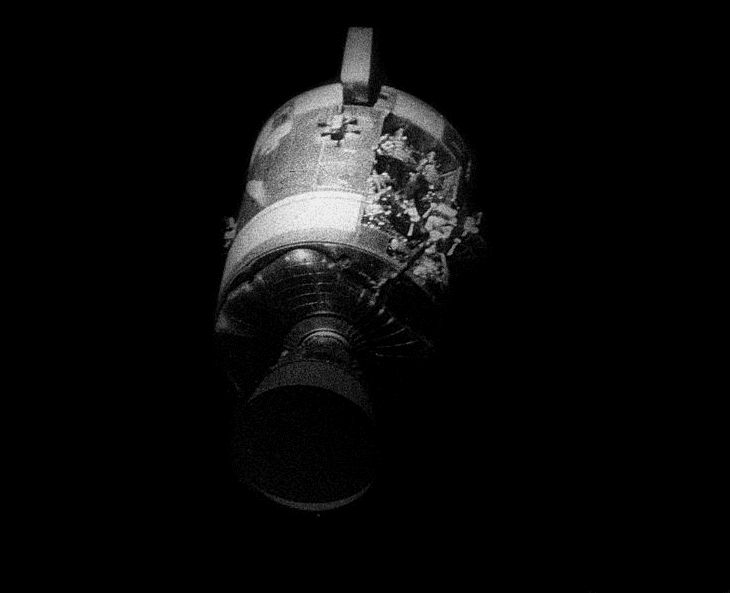 Photo: Apollo 13’s damaged service module, as photographed from the command module after being jettisoned. Credit: NASA; Wikimedia Commons. The whole world waited anxiously for almost four tense days as the astronauts used the lunar landing module as a lifeboat, until safely splashing down in the South Pacific on April 17. Disaster had been averted, but it was no miracle: it was the result of the astronauts’ courage, training, and performance under stress, and the brilliant thinking and teamwork of the Mission Control Center in Houston. The explosion crippled the main spacecraft and left the men with dangerously low amounts of oxygen, water and electrical power. Essentially, the lunar landing module – which was only designed to be used for the actual moon landing – kept them alive. The astronauts fired its relatively small descent engine to bring themselves into a path around the dark side of the moon, enabling them to use the moon’s gravitational force to whip the spacecraft back toward home, making course corrections to ensure they did not miss Earth. Numerous technical difficulties came up, but the astronauts and the controllers on the ground solved each and every one. Photo: the Apollo 13 lunar module Aquarius is jettisoned above the Earth after serving as a lifeboat for four days. It reentered Earth’s atmosphere over Fiji and burned up during reentry. Credit: NASA; Wikimedia Commons. The following two newspaper articles describe this incredible story of determination overcoming disaster. The first article is about the astronauts’ safe return, and the second describes the joyous worldwide reaction. Dauntless Crew Makes It Back! Aboard Iwo Jima (UPI) – From 205,000 miles deep in space, flying a route that skirted the edge of death for 86 hours and 57 minutes, Apollo 13 made it! Carrying its three courageous crewmen, Navy Capt. James A. Lovell and space rookies John L. Swigert and Fred W. Haise, the command ship came blazing into earth’s atmosphere Friday at 24,385 mph. The time was 1:07.40 p.m. EST – a couple hours after daylight local time – and a world that had waited breathlessly for almost four days watched with relief as the men, chilled from the minus-zero cold of space, fell into the warm South Pacific. 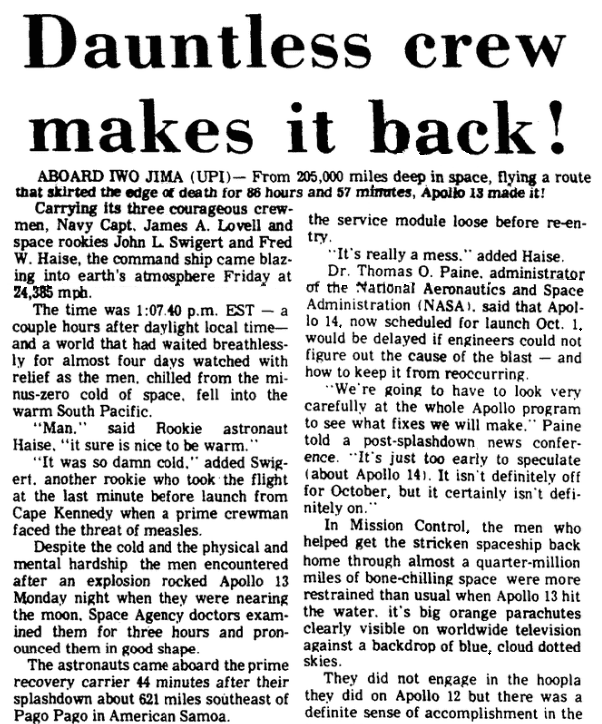 “It was so damn cold,” added Swigert, another rookie who took the flight at the last minute before launch from Cape Kennedy when a prime crewman faced the threat of measles. Despite the cold and the physical and mental hardship the men encountered after an explosion rocked Apollo 13 Monday night when they were nearing the moon, Space Agency doctors examined them for three hours and pronounced them in good shape. The astronauts came aboard the prime recovery carrier 44 minutes after their splashdown about 621 miles southeast of Pago Pago in American Samoa. They will go to Pago Pago Saturday and then to Hawaii. The astronauts are expected to return to Houston Sunday but may stay in Hawaii an extra day. Because of the explosion that rocked Apollo 13 Monday night, the space fliers returned to earth four days ahead of schedule – and without making man’s third exploration of the moon. Lovell’s wife, Marilyn, made no bones about it when she met reporters after the safe splashdown. Lovell said before the start of the flight that this was his last one – he was retiring. His decision undoubtedly was reinforced by the first look he got at the big hole in the moonship from the explosion that knocked out the command ship’s electrical power and most of its oxygen supply. “There’s a whole side of the spacecraft missing,” he radioed after cutting the service module loose before re-entry. “It’s really a mess,” added Haise. Dr. Thomas O. Paine, administrator of the National Aeronautics and Space Administration (NASA), said that Apollo 14, now scheduled for launch Oct. 1, would be delayed if engineers could not figure out the cause of the blast – and how to keep it from reoccurring. In Mission Control, the men who helped get the stricken spaceship back home through almost a quarter-million miles of bone-chilling space were more restrained than usual when Apollo 13 hit the water, its big orange parachutes clearly visible on worldwide television against a backdrop of blue, cloud-dotted skies. They did not engage in the hoopla they did on Apollo 12 but there was a definite sense of accomplishment in the windless gray-green room. Like the controllers – who also will get Freedom Medals from the President for their role in nursing the stricken moonship back to earth – the astronauts underplayed their lines. “OK, Joe,” Swigert radioed after the radio blackout that made re-entry even more scary than usual. He was talking to ground controller Joe Kerwin. But despite the cold, the fatigue, the obvious mental stress that Lovell, Haise and Swigert had been under for three days, they aligned their return flight so accurately that their splashdown was one of the best in all U.S. space history. The space fliers swallowed dextrine pills, a stimulant, before attempting the split-second maneuvers that brought them blazing back to earth. Tensions of the flight, and a near-freezing chill that flooded their space cabin, made sleep almost impossible, and ground control suggested they take the pills to bring their reflexes up to par. 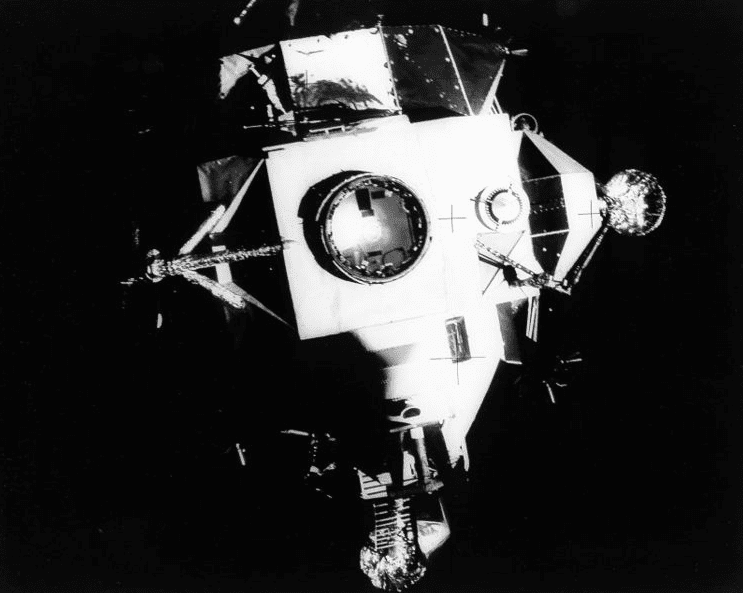 Before the re-entry, the pilots had to execute several intricate maneuvers to jettison their damaged service module and the little lunar lander, Aquarius, which saved their lives after the explosion knocked out most of their electrical power and some of their oxygen. Cause of the explosion which racked the Apollo still has not been determined, but a panel of experts has concluded that it may have been triggered by foreign matter in one of the oxygen tanks. It was from Aquarius that the astronauts drew their life-giving oxygen, and the necessary electrical power and rocket thrust to get them back to earth. First word of their danger came at 10:11 p.m. EST Monday when Swigert came on the space-to-ground radio loop. “Houston, we’ve had a problem. We’ve had a main B bus undervolt” – a major electrical failure. From that moment on, the pilots steered a very narrow path between life and death. They had already left the trajectory which would have assured them a free return to earth, using the moon’s gravity to whip them around and head them back home – so their first course was to try and get back on this course. Since the explosion had knocked out the engine on their command ship, Odyssey, they had to rely on the descent engine aboard Aquarius – by comparison a frail craft which cannot even support its own weight on earth. While the world again held its breath, the pilots successfully executed the maneuver at 3:43 a.m. Tuesday, and then whipped around the dark side of the moon and headed home. Two hours after turning the corner, the astronauts again called on Aquarius to correct their course, and this time it appeared they were safely on the narrow corridor necessary to get back to earth. But then another blow. Extensive tracking of the Apollo 13 by ground control showed it was not, in fact, on a true course, and would miss earth by more than 100 miles, dooming the pilots to travel a huge egg-shaped death orbit around earth, unless they could correct their course. Then at 11:31 p.m. EST Wednesday in an unprecedented firing of the engine aboard the little Aquarius – which already had done more work than it was ever designed to do – the astronauts put themselves in the “corridor” for home. 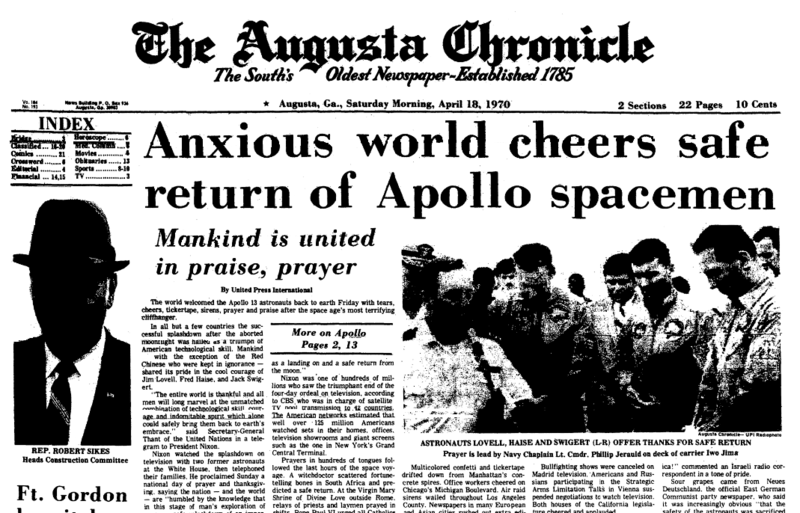 The world welcomed the Apollo 13 astronauts back to earth Friday with tears, cheers, tickertape, sirens, prayer and praise after the space age’s most terrifying cliffhanger. In all but a few countries the successful splashdown after the aborted moonflight was hailed as a triumph of American technological skill. Mankind – with the exception of the Red Chinese who were kept in ignorance – shared its pride in the cool courage of Jim Lovell, Fred Haise, and Jack Swigert. “The entire world is thankful and all men will long marvel at the unmatched combination of technological skill, courage and indomitable spirit which alone could safely bring them back to earth’s embrace,” said Secretary-General Thant of the United Nations in a telegram to President Nixon. Nixon was one of hundreds of millions who saw the triumphant end of the four-day ordeal on television, according to CBS, who was in charge of satellite-TV pool transmissions to 42 countries. The American networks estimated that well over 125 million Americans watched sets in their homes, offices, television showrooms and giant screens such as the one in New York’s Grand Central Terminal. Prayers in hundreds of tongues followed the last hours of the space voyage. A witchdoctor scattered fortune-telling bones in South Africa and predicted a safe return. At the Virgin Mary Shrine of Divine Love outside Rome, relays of priests and laymen prayed in shifts. Pope Paul VI urged all Catholics to join him in prayer. Multicolored confetti and tickertape drifted down from Manhattan’s concrete spires. Office workers cheered on Chicago’s Michigan Boulevard. Air raid sirens wailed throughout Los Angeles County. Newspapers in many European and Asian cities rushed out extra editions. Bullfighting shows were cancelled on Madrid television. Americans and Russians participating in the Strategic Arms Limitation Talks in Vienna suspended negotiations to watch television. Both houses of the California legislature cheered and applauded. “As we say in English, only in America!” commented an Israeli radio correspondent in a tone of pride. Note: An online collection of newspapers, such as GenealogyBank’s Historical Newspaper Archives, is not only a great way to learn about the lives of your ancestors – the old newspaper articles also help you understand American history and the times your ancestors lived in, and the news they talked about and read in their local papers – as well as more recent events. Do you remember following the saga of Apollo 13’s return? Please share your stories with us in the comments section.